Espresso Macchiato – Single shot of espresso. 1 to 2 tablespoons of foamed milk as a topping. Served in an espresso cup. Espresso Dopio (Double Espresso) – Typically served in a cappuccino cup, a double shot of espresso is used – approximately 3 ounces. Caffe Americanno – Hot water is used to dilute espresso to reach drip coffee strength. Spicy Viennese Espresso – A blend of a double-shot of espresso, ½ teaspoon of cinnamon, 4 ground cloves and ½ teaspoon of allspice. Top with whipped cream. Black Eye – A double-shot of espresso added to one cup of American style drip coffee. Espresso con Panna – A single or double espresso shot topped with whipped cream. Espresso Romano – Fresh lemon peel is the topping of a single shot of espresso. Cappuccino – A traditional cappuccino is made with 1/3 espresso, 1/3 steamed milk and 1/3 foam. Served in a small cup, the entire drink is between 4 and 6 ounces. The cappuccino can then be topped with a light sprinkle of ground chocolate, cocoa powder, cinnamon, nutmeg or vanilla powder. Flavored Cappuccino – Coffee syrup is a common method of flavoring your cappuccino. A high-quality choice is Monin syrups. Mocha Cappuccino – After dissolving cocoa or chocolate syrup with the milk to taste, mix 1/3 part espresso to 2/3 part steamed milk. 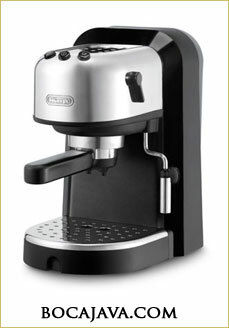 Caffe Latte – Mix a double-shot of espresso with approximately 5 ounces of steamed milk. The overall drink usually measures about 9 to 12 ounces. Little or no foam is typically added to the top. Flavor your latte with coffee syrup. Espresso Martini – Blend 1 ounce vanilla-flavored vodka, 2 ounces coffee-flavored liqueur, 1 ounce cream or milk, and 1 cup crushed ice in a cocktail shaker. Vigorously shake ingredients to chill, and then pour into martini glasses. Kahlua Espresso Martini – In a cocktail shaker, add 1 ounce Kahlua, 1 ounce vodka, and ½ ounce fresh brewed espresso. Add ice and vigorously shake. Strain contents into a chilled martini glass.